Okay, again, I’m a bit tired, so I’m keeping this short, and am not trying out my own scenarios this time. You know what? Not being snarky — I’m glad they’re being clear here. Oh wait, that’s somebody else being clear about intentions, not necessarily the Democrats. In addition to their multiple calls for greater gun control, Democrats have found another message they believe is a winner for the 2018 midterms. They want to repeal the GOP tax cuts. They can’t stand the idea of people being allowed to keep more of their own money. Hmmm, top 1% gets 83% of the “benefits”? I wonder how much in taxes the top 1% pay. The individual income tax matters—a lot—*because it is the largest single source of U.S. revenue*. And its share has risen in recent years. For 2018, it could raise 50% of total federal revenue, according to estimates from Congress’s Joint Committee on Taxation, up from about 48% last year. Hmm, that’s not top 1%, though. Let’s check elsewhere. Approximately 80.6 million or 46% of Americans won’t pay any federal income tax, up from 76.4 million people before President Trump’s Tax Cuts and Jobs Act, according to data from the Tax Policy Center, a nonprofit joint venture by the Urban Institute and Brookings Institution, which are both Washington, D.C.-based think tanks. That’s below the 50% peak during the Great Recession. They still obviously pay sales tax, property taxes and other taxes. And, importantly, payroll taxes. Many of the people in the 80.6 million, though, aren’t paying payroll taxes because they’re not employed — they’re retired, or they’re students, or they just don’t work for whatever reason. That’s a big ole duh. Still not giving me the 1%, though. Let’s dig some more. This is from before the tax law was passed. 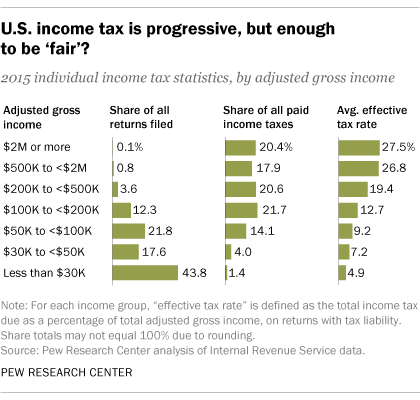 The individual income tax is designed to be progressive – those with higher incomes pay at higher rates. A Pew Research Center analysis of IRS data from 2015, the most recent available, shows that taxpayers with incomes of $200,000 or more paid well over half (58.8%) of federal income taxes, though they accounted for only 4.5% of all returns filed (6.8% of all taxable returns). 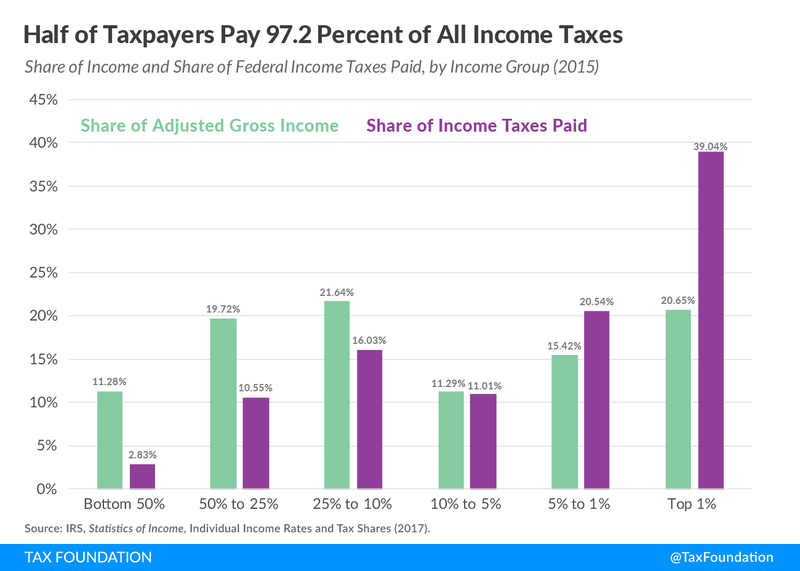 It looks like the top 0.9% of returns in 2015 represented 38.3% of federal income tax paid. There ya go. The share of reported income earned by the top 1 percent of taxpayers rose slightly to 20.7 percent in 2015. Their share of federal individual income taxes fell slightly, to 39.0 percent. It’s kind of hard to give tax cuts to those who aren’t paying those taxes. Yes, there’s the Earned Income Tax Credit (aka negative income taxes), but the point remains. REMIND ME AGAIN: WHO GOT A TAX CUT? As I said, I’m not doing my own scenarios today. Luckily, the Tax Foundation did a bunch months ago. In these scenarios, all of the people received tax cuts, some bigger than others, obviously. The highest cut, percentage-wise, was for the single parent with 2 kids, earning $52K/year. He got a 36% cut compared to prior taxes, or a 3.64% cut compared to his income. If you look at the dollar amount of the cuts, the largest cut was for the couple earning $2 million per year. That’s well above the 1% of filers. However, if you look at their percentage reduction, it’s only a 3% decrease in their taxes (or 0.95% compared to their income). And they’re still paying more than everybody else in the chart. Remember: left to right goes from lower to higher income. So the one point really out of place is Amber — who is a single earner, no kids, with a 7% retirement contribution using the standard deduction. 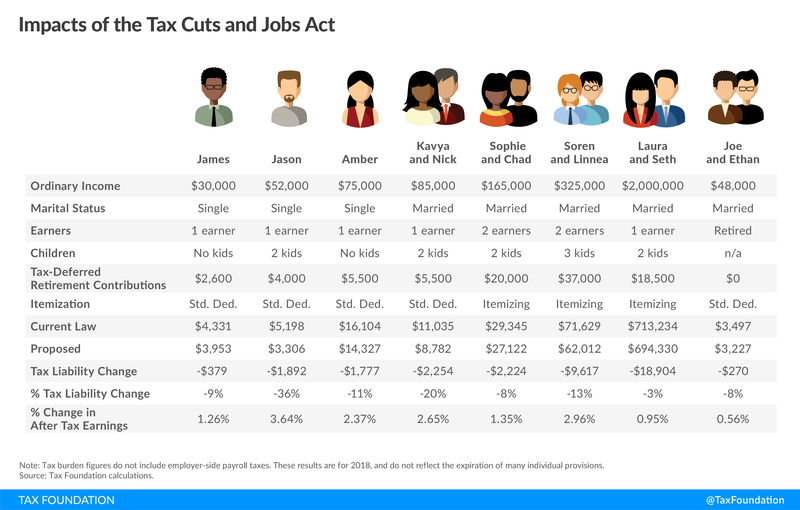 And note: even before the TCJA, Amber was paying more than the three scenarios to her right: Kavya and Nick have slightly higher income but also two kids; Sophia and Chad have over double the income, a higher percentage contribution to retirement and two kids; Soren and Linnea have even higher income, about a 11% retirement contribution, and 3 kids. The kids make a lot of difference. Those receiving the least in cuts, percentage-wise, either have no kids or really high incomes. Yes, I can do this on dollar amounts, but percentage amounts actually make more sense in terms of materiality. $1000 means a lot more to someone making $30,000 than it means to someone making $2,000,000. No, the tax cuts are not evenly distributed, even on a percentage basis. Some higher-earning people pay lower rates… and they did before. If you want to get rid of any tax credit for dependent children to make it more fair, by all means, do so, Democrats. Because removing the SALT cap does not make the system fairer. The problem for folks like Bernie & Nancy is that they’re heavily dinged under the new tax law, because they own multiple properties and pay a lot in property tax (at the very least). How dare the feds make them pay more in taxes! I think the SALT cap should be 0, by the way. But $10K is a good start. So we’re having the top 1% going from about 38% of income tax, up to 43%. The top 0.1% alone (which includes the 1%), are going from about 19% to 22% of all the individual federal income tax collected. And, mind you, some of the people in the 1%/0.1% are there for only one year, due to an event like selling a business or some other one-time activity. Ask the Obamas if they made millions of dollars in income every year, or just specific years where they were given large book contracts, as an example. So, anyway, I hope taxes really are a theme this year, because I think a case can be made for higher taxes — but the case is not “That’s unfaaaaair!” when what they’re whining about is rather rich people having to pay more. The problem is that Democrats pretty much have a lock on the states where the SALT cap is going to bite, so it’s not exactly going to win extra votes in, say, West Virginia to whine that some rich folks in other states may have to pay higher taxes. I don’t feel like commenting on these, but they all relate to the TCJA. See y’all next week with more taxes!